We present images of a 50-year-old man who is monitored in our Internal Medicine Ward for lumbago and coxalgia over two years, subsequently diagnosed as Gorham-Stout disease. In the MRI of the hip an altered bone pattern is detected in a diffuse form with no osteolytic or sclerotic lesions. 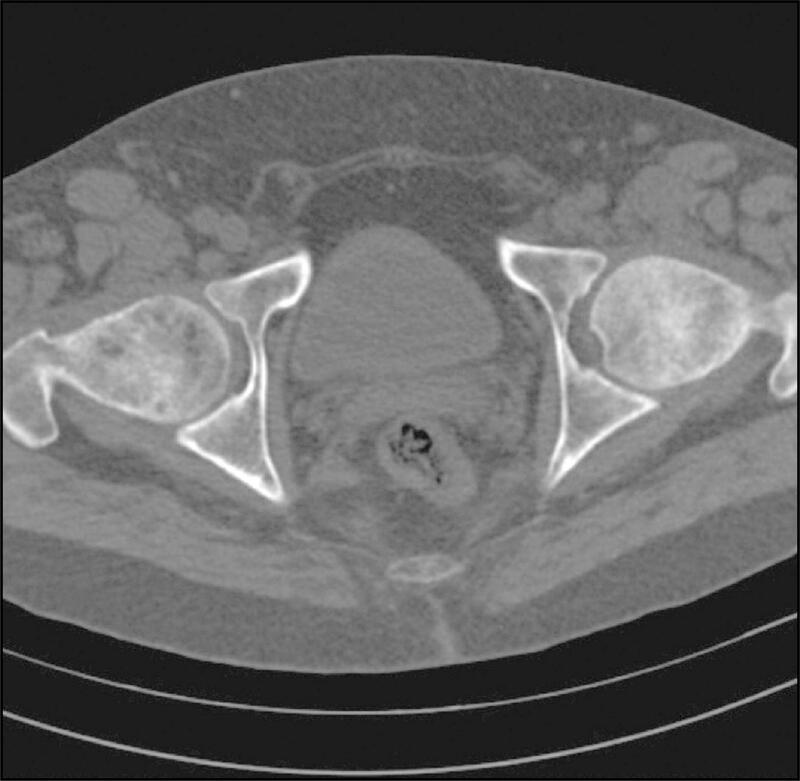 Bilateral necrosis of the femoral head was observed in the hip (Figures 1 and 2). In the blood analysis, only 185 IU/L alkaline phosphatase stood out. 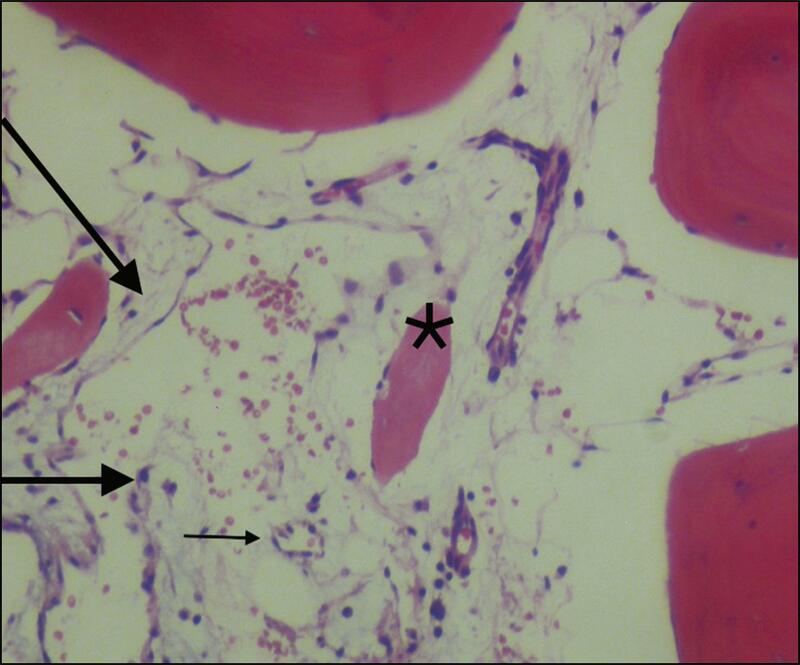 The result of the biopsy of the femoral head reported vasodilation with an irregular contour with a malformation; staining with marker D2-40 reported vascular and nonlymphatic proliferation (Figure 3). Gorham-Stout disease or Gorham syndrome, also known as vanishing bone disease, is a clinical condition characterized by progressive destruction of bone tissue (osteolysis) and growth of lymphatic and vascular tissue in the affected areas. Although any bone structure can be affected, the most frequent involvement is at the level of ribs, vertebrae and pelvis. The cause is unknown, although it is suspected that alterations in vascular growth factors, changes in pH and oxygen deficit may be involved in the pathophysiology of the disease, since the biochemical changes that occur in the tissue due to these causes favor altered growth and remodeling of affected structures. The clinical course usually begins with fractures and severe pain, there being a variety of symptoms according to the diseased bone (loss of teeth in the case of the jaw or neurological signs in the case of the vertebrae). Treatment involves bisphosphonates and interferon α-2B. Sirolimus is also considered as a therapeutic alternative, although the series are testimonial. In addition, the adoption of support measures that may reduce or stop chylothorax or stabilize the affected skeletal regions is indicated. Radiotherapy can be used in combination with these therapies but, in general, it is reserved for refractory or rapidly progressive disease.